The Ontario Great Lakes rivers and tributaries like Niagara River and Saugeen River are second to none for world class Steelhead, Salmon and Trout. There is a season and location for every method of angling these species. Choose from centre-pinning, float fishing, fly fishing or spin casting to land your next personal best with Nomad Adventures! These are primarily walk and wade fishing trips but can be upgraded to use of boats, drift boats, and kayaks for steelhead and trout trips, as a method cover water in the larger river systems. When the steelhead and trout drop out of the systems post spawn, some excellent resident trout fishing can be had from June to September. Prime season spring and fall trips fill fast, so be sure to book early. Currently the fastest growing segment in both sportfishing and paddling, Kayak Fishing should not be overlooked as a means of satisfying your desire to fish. Nomad Adventures kayak fishing specializes in salmon, steelhead, trout, and smallmouth bass. River smallies and small inland lake trips are an excellent way for beginners and families to enjoy some great fishing at a leisurely pace. River fishing smallmouth bass from a kayak in Ontario just makes sense! There are many other species to be caught from a kayak on the numerous inland lakes and Great Lakes of Ontario too. Kayak fishing for Great Lakes salmon and trout in the Southern Ontario peninsula simply cannot be beat! 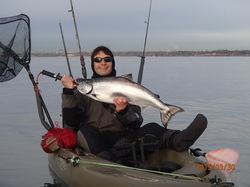 Or take a summer mother-shipped kayak fishing trip to the Lake Ontario Blue Zone for salmon and steelhead. 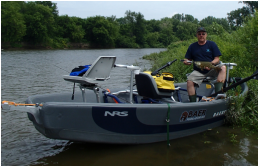 Southern Ontario Rivers offer spectacular year round fishing opportunities with easy access by drift boat. These three man boats offer two guests to be guided through prime fishing waters from April to December depending on your preferred species. It is one of the most comfortable ways to enjoy some of the best fishing this province has to offer! 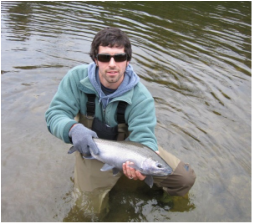 Opportunities for steelhead are open April and May, then again from October to December. Warm water species trips such as bass, musky, northern pike, and walleye run from May to October, depending on regulations. Spring and early summer trips are also available for resident brown trout and rainbow trout. Grand River, Saugeen River, and sometimes Maitland River depending on water level, are all available as trip locations. We have trips for all angling styles be it fly fishing, float fishing or conventional gear anglers.